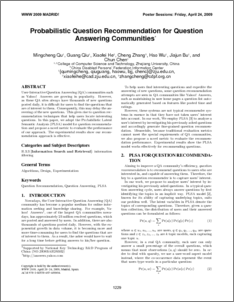 User-Interactive Question Answering (QA) communities such as Yahoo! Answers are growing in popularity. However, as these QA sites always have thousands of new questions posted daily, it is difficult for users to ﬁnd the questions that are of interest to them. Consequently, this may delay the answering of the new questions. This gives rise to question recommendation techniques that help users locate interesting questions. In this paper, we adopt the Probabilistic Latent Semantic Analysis (PLSA) model for question recommendation and propose a novel metric to evaluate the performance of our approach. The experimental results show our recommendation approach is effective.